It used to be me. Or so I thought. When they were little, I was the one who provided everything they needed and protected them from anything that might hurt them. I set up their routines and walked them away from situations that were too much for their young hearts to handle. I set the boundaries, set the stage, set out the activities. I said yes, said no, said too much, said too little, said things wrong, said things right, and said it will all be okay. I was in charge. I was in control. I was the one. They’re big now. They are amazing and skilled and smart and fun, and one by one, they are launching. Their steps are becoming their own; their thoughts and behaviors are less and less a result of my commands and instruction and more and more a brave leap of their own long-legged independence. My prayer is no longer crafted out of the ideas on my own heart. Recognition of truth has left me with very few words. I know little about tomorrow. You are the One who knows your Kingdom plans for my kids. I’m simply the one whose heart longs for their good and for their walk to be on the path you’ve carved for them. I’m not who I once thought I was. I’m not their provider. I’m not their protector. I’m a huge part of their life on this earth, but I’m only their mother. I’m the one God gave them to show them love and guidance. But you, God. You are the One who knows what they need and how to provide. Protect them, Lord. Protect them from people who do not have their best interests in mind, from people who are self-seeking and heartless, from people who will hurt them. Protect them from apathy. Protect them from becoming self-centered, self-seeking, self-deprecating, and self-motivated. Provide them the heart to lay aside self in order to seek You. Provide for them, Lord. Provide people to encourage and hold them accountable, to build them up and make them stronger, to inspire and challenge them to be more like Christ. It takes a village. Build it strong and high and full. Provide my children with confidence and skill, tools and words to get themselves out of any situation that would be harmful to them in any way. Provide them with the confidence to do right and strength to flee from wrong. Provide everything they need, because You are the One who knows precisely what that means. Do what I cannot do. I trust you with my children. Thank you for the blessing and honor of being Mom to my sons. How cool of you to give me my four favorites. How wise of you to grow me along with them. How gentle of you to hold us so gracefully. How perfect of you to love us so consistently. Thank you for this sobering reminder, even when mine are still little. I am not able. But in my weakness and complete inability, He will show Himself strong! I love you my sister! Wow. 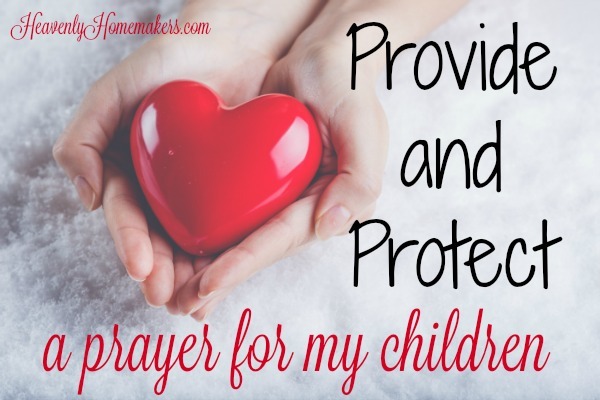 My husband and I have three sons, 12, 5, 4 and this brought me to tears as I prayed it right along with you for them. I love them with all that I am, but they have a Heavenly Father who loves them even more. I thank God for that. And I’ll continue praying protection, strength, guidance and provision for them. Thank you for the reminder to ‘Pray without ceasing’ 1 Thessalonians 5:17. Oooooooo…this is a KEEPER–and FRAMER!! Our boys are two and three and I know that I easily fall into believing that I am their protector/provider. We pray Col. 1:9-11 for our boys too, that they “might be filled with the knowledge of his will in all wisdom and spiritual understanding; that they might walk worthy of the Lord unto all pleasing, being fruitful in every good work, and increasing in the knowledge of God; strengthened with all might, according to his glorious power, unto all patience and longsuffering with joyfulness. Now I’ll be adding Eph. 3:17-19 to that prayer, thank you for sharing! Thank-you for sharing your heart and this prayer for our sons. I have two, 16 and 18, and prayed this for them today! Your prayer is so beautifully stated – inspired and inspiring! Love you, Laura. I love this! I never realized how vulnerable it would make me feel to be a mom. It is teaching me to trust God more as I entrust our sweet daughter to Him, because though I can control a lot while she is young, I can’t control it all. Hi Laura. I just wanted to thank you for your beautiful prayer you shared in the York News Times today. Really hit home for me as my husband and I have a senior in high school and a sophomore at UNK. I love reading your column and you are so funny in your descriptions and honest perspective on life. Thanks for being a light in an often dark world! Thank you, Jo. I appreciate your encouragement so much!